Joe Portelli, left, with Tim Beach, of PT Lord Dakin and Associates, selling Boer does at the Dubbo sale. Photo – Rebecca Sharpe. 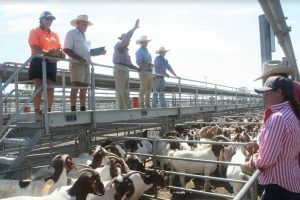 GOAT prices suffered from a lack of restocker activity and fewer trade buyers at the quarterly Dubbo goat sale last week. 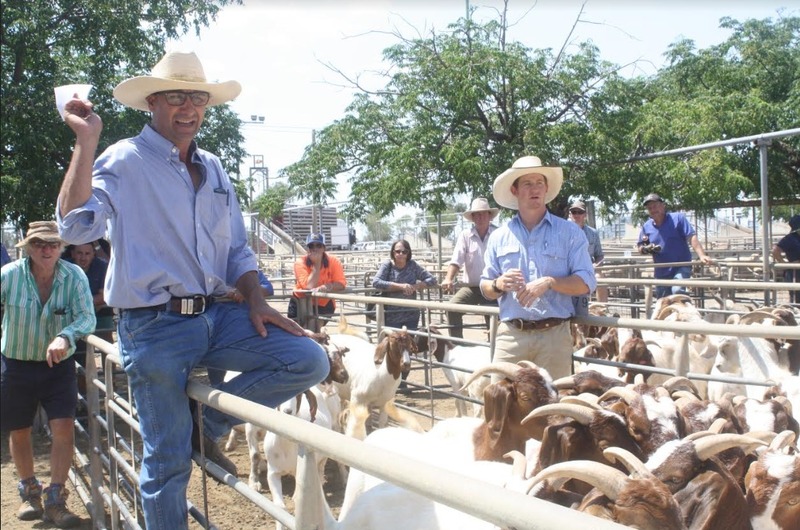 Boer bucks sold to $290, wethers made to $150 and young does to $120 at the sale; however, PT Lord Dakin and Associates agent Joe Portelli said restocker meat goat prices were estimated at $5-$10 lower at the February 5 sale as water was hard to source in many areas. Mr Portelli attributed the non-attendance of a few buyers at the sale to the numbers of rangeland and farmed goats going direct to abattoirs in the drier conditions, rather than being held and fed on. “With this hot weather they would be trucking them off water and blokes would be moving them on just to prolong the feed for their cattle and their sheep. “Numbers aren’t aplenty at the moment,” he said. 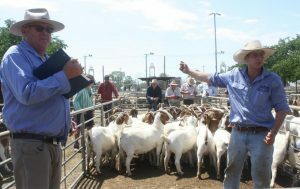 More than 2300 goats were yarded at the sale, which was supported by a large number of vendors from east of Dubbo, particularly Mudgee region producers. Graham Anderson, left, and Tom Pollard from Peter Milling and Company selling Boer does at the Dubbo sale. Photo – Rebecca Sharpe. Mr Portelli said not many consignments from the New South Wales’s western region were offered at the sale. He said over-the-hook prices were currently “pretty solid” — from 630-650c/kg for anything that dresses out above 8kg. A single Boer buck from Dale Hayes, Dunedoo topped the Dubbo sale, selling for $290 to Landmark Dubbo. The balance of the Boer bucks averaged $120-$130. The top end of the Boer wethers sold to $150 for a line of 16 to 18 month-old goats from Narrabri. A line of two to three year-old Boer does from Pattinson family, Mudgee topped the category at $120. The better end of the rangeland bucks sold to $128 and the does sold from $55-$78. Young goats to the restockers sold from $20-$65. Olsen Agencies auctioneer Cleve Olsen selling a pen of Boer does for $103 at the Dubbo goat sale. Photo – Rebecca Sharpe. Source: Rebecca Sharpe, Dubbo Stock and Station Agents.